This recipe is featured in the 21 Freezer Cooking Recipes from Costco Meal Plan #5. This recipe is part of the latest 21 Gluten Free Meals from Costco Plan. Please note the following about the way that the recipe is written below and how it is written in the plan. The recipe below is written for 1 meal. The plan calls for the recipe to be doubled, so I suggest that you cook the chicken and BBQ sauce for both meals at the same time, then you can eat one portion when you cook it, and freeze the other half for later. It’s my favorite ‘CPK pizza flavors’ wrapped in a corn tortilla y’all. Ever since the days of traveling through the Miami airport and beelining it to the CPK for this pizza, I’ve adored these flavor combination…in part because of the flavor, and in part because of the happy memories they bring back from our traveling back and forth to the Dominican Republic. BBQ sauce – fresh cilantro leaves – red onion – gouda or sharp cheddar. Seriously, I might start drooling just thinking about these flavors. Combine all these great flavors in a corn tortilla and you’ve got your next ‘Mexican night’ dinner. Even though it’s not really Mexican food, we can pretend that it is because it’s all wrapped in a corn tortilla. I call these recipes ‘street tacos’ because they use a corn tortilla, which is typical for a street taco or food truck taco. BBQ Chicken Pizza that inspired these tacos. Place the chicken breast in the slow cooker with the BBQ sauce plus about 1/2 cup of water. (I prefer to add a little extra moisture in the slow cooker when adding BBQ sauce to keep it from burning around the edges.) Set on low and cook for 8 hours. Or high for 6 hours. Once the chicken is cooked, use a fork or stand mixer to shred the chicken, adding some sauce in to keep all the BBQ flavor with the chicken. Prepare the onion and cilantro. Assemble the tacos by loading one (or two, if they are flimpsy and tear!) 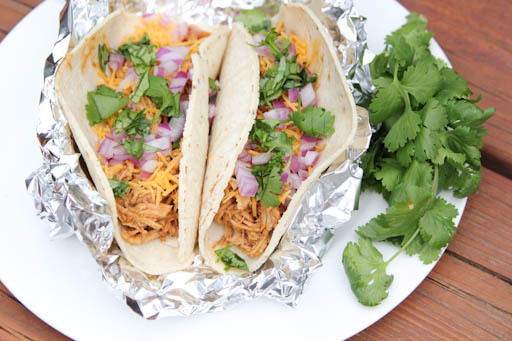 corn tortilla with the shredded BBQ chicken and the red onion, cilantro and cheese toppings. Serve BBQ Chicken Street Tacos with fresh fruit or veggies. Freezer Instructions: freeze the cooked chicken in a freezer baggie. Thaw overnight in the fridge when ready to use and reheat in a sauce pan on the stove. Assemble as instructed above. This recipe is feature on SouthernPlate.com’s Meal Plan Monday #6. Did you heat the corn tortillas or fry them little? For the 21 Costco meals, the shopping list includes the roaster chickens, but this recipe lists chicken breasts that you cook. Can you clarify how to prep this recipe for freezing? Karry – the printables for the Costco meal plan give instructions for how to change up the recipes using the ingredients for the specific Costco plans. The original recipe is a slow cooker recipe as you are cooking the chicken breasts etc., but the freezer plan for Costco warms it up on the stove since it’s already cooked chicken. The evening I made this as tacos with the accoutrements, it was super good and we all ate a lot. The next day the meat was noticeably sweeter. Like VERY sweet. There was so much left, so I froze the rest. It just didn’t taste as good as that first day when I unfroze it for quesadillas. Ended up going to the dog. =\ It was strange because I didn’t use a bbq sauce described as sweet. I can’t remember what it was, but it was Whole Foods organic brand. When I tasted it before dumping it in, it had a spicy zesty kick.